Harp lessons are offered to beginning students. Previous musical training is helpful but not necessary. You will need to have some type of harp available for daily practice. 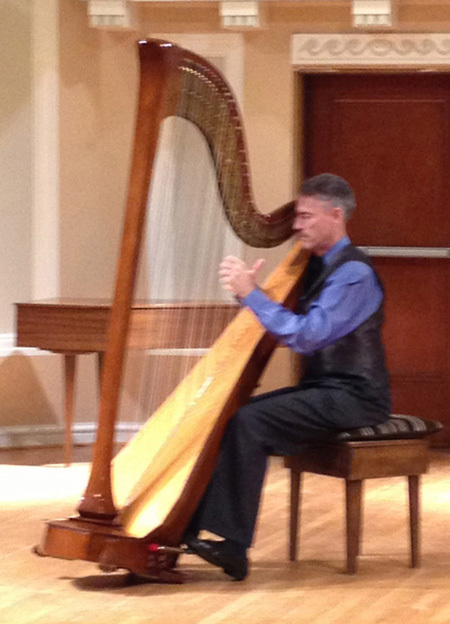 If you do not have a harp, I can help you to arrange a rental. The appropriate age for beginning children varies depending on temperament, usually age six or after. Lessons should be a positive experience, and success is more likely if the child is ready. It is best if they have some basic academic skills such as the alphabet (the note names use the alphabet letters A through G, forwards and backwards) and math (counting the beats in a measure, adding note values such as 2+1+1=4). They need to have an adequate attention span, some patience, and an ability to concentrate, although music lessons will help them to improve all of these qualities. All students learn to read music. In addition to learning to play repertoire pieces, the students' creative mind will be stimulated by regular improvisation and composition activities. Included in lessons is training in music theory, sight-singing, and ear training. Students will learn to play music in a variety of styles. Students will have the opportunity to perform in a group recital once or twice per year. Daily practice is essential. For beginners, I require a minimum of 30 minutes per day, six days per week. Students who wish to excel in music eventually will need to exceed this basic requirement. Ideally, students come to their practice not merely from a sense of duty, but out of the love and enjoyment of music. Parents need to support this discipline using, as motivation, the student's enthusiasm for music and the joy of a musical household. Just as many families make shared meal time a priority, the importance of daily time at the harp needs to hold a place in each day's routine, ideally at the same time each day. Lessons are taught at my home studio in San Francisco's Castro neighborhood near Dolores Park, on 19th Street between Church & Sanchez Streets. Two-hour street parking is generally available, and the "J-Church" MUNI line is very close. Depending on scheduling and your location, lessons in your home in San Francisco may be available for an additional fee. I am also available to teach piano and organ lessons. Piano lessons are also taught at my home studio. Organ students must have access to an organ for regular practice. Feel free to contact me if you have any questions or are ready to register for lessons.